Love Being a Mummy : Introducing our new addition to the family!!! Introducing our new addition to the family!!! Hello!! I have found it hard to have time to drink a cup of tea never mind write on my blog, I think I forgot how much time a newborn takes up!! 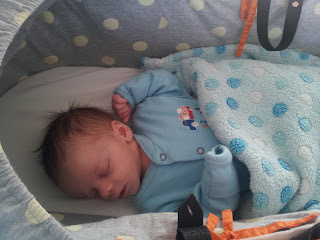 When I started this blog Callum was about 5 months old so I guess he was in a routine so a bit easier to blog. Every time i'm about to log into blogger i'm needed! Luckly my other half has let me have some 'me time' and looking after Annabelle and Callum whilst my newborn is sleeping!! He was born on the 27th November 2012 so he is nearly a month old!!! Annabelle and Callum on a whole are happy with their baby brother!! Annabelle can't stop kissing him and callum strokes his head now and then. I am not going to lie having 3 under 4 is a challenge!! So I will write seperate posts about the last 4 weeks!! So firstly I think I will post about late pregnancy and the Birth!!!! Congratulations he is adorable! I must admit I found the change from 2 to 3 kids the hardest - if you can do 3 then you can do 8 ! Stopped Breastfeeding Today! If only it was easy!